Imagine that you are a young man of twenty-four. All your short life, you have lived for the sole purpose of committing your soul to God as his servant, you have no other ambition, hold no other dream but to become a priest, and so the day of your ordination arrives, the moment you have anticipated for so long. No shadow has ever touched you, no doubt ever plagued you. You shall live your life for God, and God shall return your devotion in equal measure. Until one fated, fatal moment when you look up at a point in your ordination ceremony at the cathedral, and you see a not just a woman, you see Woman, the epitome of all the Church denies and demonizes, the quintessence of all desire, all beauty, of all that offers another kind of love you have never known before and in a heartbeat, all your former self falls away and all your devout ambition dies and you can see, imagine, dream and breathe of nothing at all else. So begins the story titled ‘La Morte Amoureuse’ by Théophile Gautier, or as it is known in English, ‘Clarimonde’. Published in 1836, it is a story of love and loss, desire and delusion, a simulacrum of life and the bitter reality of death. On Scent Less Sensibilities and elsewhere, the story of Clarimonde marks the start of a unique group collaboration of five bloggers and six perfumers, namely Mandy Aftel of Aftelier, Ayala Moriel, Dawn Spencer Hurwitz, Monica Miller of Skye Botanicals and Maria McElroy and Alexis Karl of Aroma M and Cherry Bomb Killer Perfume. Each of the contributing bloggers will provide their own perspectives on the perfumers’ individual interpretations of the story. My readers will know I came over to the dark side a very long time ago. Every day is Halloween chez Tarleisio! When I was asked to join The Clarimonde Project by curator, instigator, friend, Great Facilitator and fellow blogger Lucy Raubertas of Indie Perfumes, I couldn’t help a little devilish happy dance of excitement. As we all read the same, haunting story Gautier wrote so long ago, we each will have our own personal twists to add, whether our medium is perfume or prose, and so, I have spent the past three days since the arrival of my first perfumed tribute letting the ghosts of Monica Miller of Skye Botanical’s unique interpretation of ‘Clarimonde’ speak to me, as all ghosts do if I only will sit still enough to listen. Now, as I sit with my cooling Earl Grey, my iPig on low and my green magic candle burning just past the midnight witching hour, the ghosts have finally emerged to tell their tale. Monica chose a most unusual three-fold approach: a perfume called ‘Sangre’, and two 100% botanical, perfumed lip stains to accompany it, a red lip stain called ‘Scarlet Kiss’, perfumed with incense, and a purple stain called ‘Purple Shadow’, perfumed with myrrh and spices. When used together, they form a whole enveloping experience – a lip stain that also perfumes the breath, a perfume that accentuates and compliments the lip stains, even a lip stain that stings as surely as any vampire’s kiss would. The first day, I applied the red stain, ‘Scarlet Kiss’. I’m a longtime fan of lip stains, and although it wore on me more as a lipstick on my lips, ‘Scarlet Kiss’ managed to last well into the morning and worked beautifully for my fair coloring, and I don’t normally wear red lipsticks at all. The shea butter kept my lips moisturized and smooth and semi-glossy, but the biggest surprise was the incense used to perfume it – it was a way to inhale/experience incense in a tactile, sensory manner I’ve never tried before. I can imagine this on the courtesan Clarimonde’s lips when she appeared in all her glory to the hapless young priest Romuald…the otherworldly beautiful sensual epiphany that shook his faith and his very being to its core. I will wear this until it’s gone, and then I will mourn its departure. Or else I shall mourn that no other shade of red lipstain/lipstick is quite so flattering or so enticingly perfumed with incense, one of my most favorite notes. The second day, I wore the purple stain, ‘Purple Shadow’. Here, dear reader, is the Kiss of the Vampire…or as I see it, the point in the story where Romuald is called upon to perform last rites for the dead Clarimonde, and as she lies still in all her deathly pallor and allure, he kisses her – calling her back to life. ‘Purple Shadow’ is perfumed with myrrh – used as a breath freshener since antiquity, too – and is tinted a delicious shade of purple. Alas, this color was not a requited love, but the effect of myrrh on the breath and that sharp tingle/sting of peppermint that made my lips swell slightly was worth it! If I can ever imagine a vampire’s kiss – no hard stretch to my decadent imagination – I can imagine it would burn and tingle precisely as Purple Shadow did. Ah, that fragrant myrrh that somehow seems both sacred and sorrowful to me, a perfumed tear you are compelled to shed simply for being so evocative. Which brings me to ‘Sangre’ (Blood), the perfume. ‘Sangre’, writes Monica in her accompanying letter, is “a dark fruity floral designed to satiate and sedate the visions of the night’. Don’t let that description deter you. This is unlike any fruity floral I have ever come across. I breathe in ‘Sangre’ and it does indeed evoke something of the sacrament of blood through that dark alliance of raspberry/blackberry and Roman chamomile, but it also has a clearly defined and ever darker base right from the start as it breathes on my skin. Combined with either lipstain, it envelopes you in scent in an all-pervasive manner we’re no longer accustomed to in our sanitized, breath mint present, and in a way I’ve never tried before. I breathe in the incense on my mouth, the dark, velvety floral and geranium strangeness of Sangre on my skin as it develops, and one word alone is enough to describe the combined effect – haunting as a memory you can never forget and both hope you never do and also desperately ache to do. 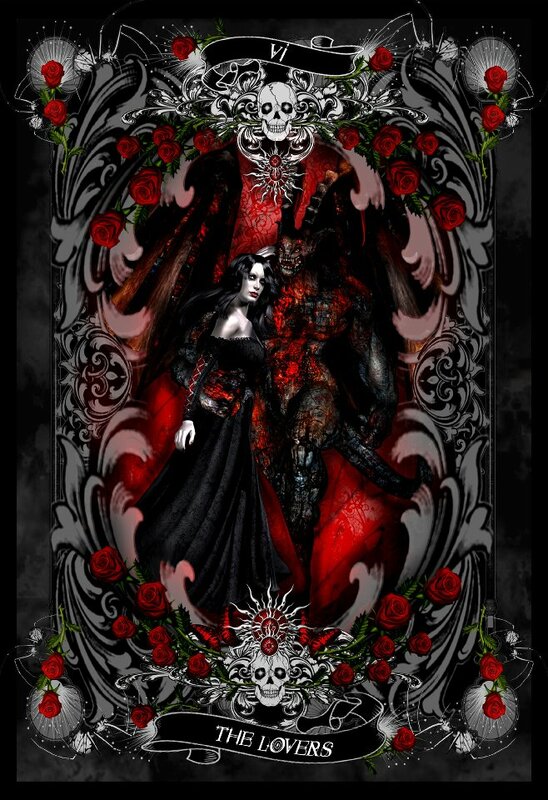 To my Gothic sensibilities, Sangre is a dual perfume…dark as all true desires, strange as love always is, and heartbreaking as all fatal love stories must be. It is both comforting and heartbreaking at one and the same time with that deep velvet heart and that dark, polished satinwood base of musk and honey, frankincense and patchouli…as if you had retired to your bed to mourn the loss of the love of your life, wept your bitter tears of regret to reach a fragile state of catharsis, and finally, many hours later, come to realize a hard yet necessary truth – that it is better to have loved and lost than never to have loved at all. At least, you loved. You lived. You lost, as all star-crossed lovers do, since Eros is a fickle god like all gods, and no mere mortal can survive the celestial heights of Olympus for long. Romuald lived out his days with the loss of eternity. Nearly two hundred years later on a dark and cold, star-bright October night, a solitary blogger found his story and was wrapped in a perfumed experience unlike anything she had ever tried, a unique blend of sacred and sorrow, scent and stain, blood…and kisses. 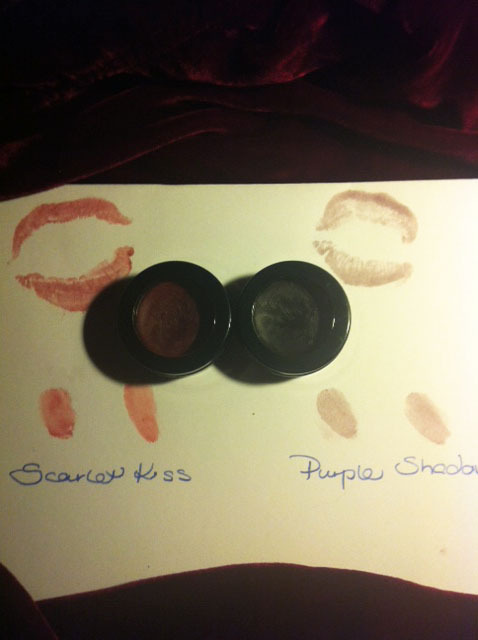 A box sample set of Scarlet Kiss/Purple Shadow lip stains and a sample of Sangre is available at The Perfume Pharmer also available individually. Monica Miller is also known as The Perfume Pharmer. Disclosure: Sample provided by Monica Miller for review. A spectacular introduction to both vampires as well as Clarimonde can be found at Lost Past Remembered, one of the participating blogs. 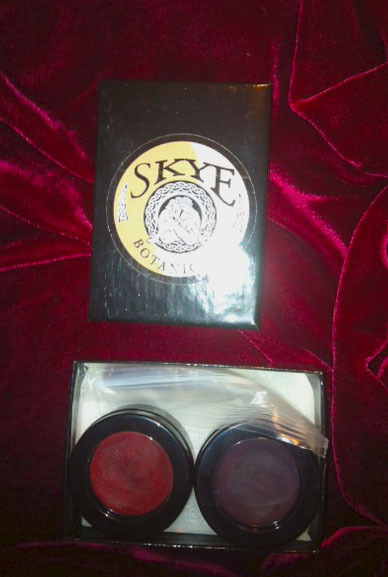 Lucy of Indie Perfumes has also reviewed the set here.